Progeria is a genetic abnormality where a baby grows or age rapidly. It comes from a Greek word which means prematurely old. It affects mostly children and this kind of disease condition gives the children and old appearance. It is usually a rarer kind of disease condition. 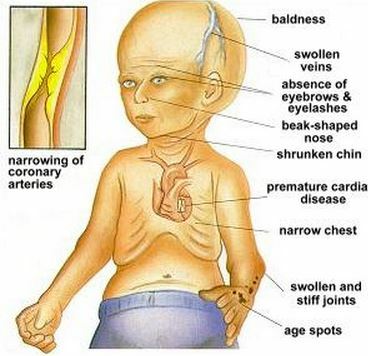 The disease is sometimes called as Hutchinson- Gliford Progeria syndrome or Hutchinson-Gliford Syndrome. Its name was based from the one who first describe the condition and his name was Jonathan Hutchinson. He describes this disease condition in the year 1886. Upon his discovery, it was estimated around 100 cases have been reported. In 1897, Hastings Gliford was able to record the syndrome. Hence, the combination of the two discoverers Hutchinson-Gliford Progeria syndrome or the HGPS was coined. As mentioned, Progeria came from a Greek word “pro” meaning before and “geras” meaning old age. This is a rare genetic disorder where children are the most often reported to have. According to studies, most of these children will live only up to the maximum age of 10-15 years old, if lucky. One fact, Children manifest physical appearances that are like an old woman or man. Yet, despite these changes, one thing will remain constant. A child with Progeria will still have average to above average mental intellect. Meaning, their intellectual capabilities are not affected whatsoever. So they appear old, but think like a child. Aside from that, the appearance of a child diagnosed with Progeria is that of small version of a child. That even when they reach teenage years, they will weigh around thirty pounds, which can be compared to a two year old child with a three and a half feet tall. They have bowl legged shape and they have brittle bone structure. Actually after birth, the child will basically appear normal and its symptoms will only be visible at about six months to one year. Its head and face manifest baldness, scalp veins, narrowed face. There is delayed tooth formation since their jaws are smaller than normal. Aside from that the eyelashes and their eyebrows are not quite visible. With regards to their bones, they have a fragile bone structure and have short stature and positive hip dislocations. Their skin also undergoes changes such as their connective tissues have been hardened and tough. They have a skin disease called scleroderma. This rare genetic disease is an autosomal recessive kind of disease condition. About 90 percent of children who are diagnosed with Progeria have mutation in one gene. The gene is known to encode Lamin A, which is a protein gene that holds together the nucleus’ cell. According to theory, the person having Progeria has a defective (LMNA) Lamin A Protein making the nucleus more unstable, hence, leading to the symptoms of premature aging. The real reasons or etiology why this disease condition happens have not yet been pinpointed out. In addition to that this disease condition occurs intermittently. Even if this is a genetic kind of disease, not everyone in the family will be able to be diagnosed with Progeria. Medication such as Low dose aspirin can prevent occurrence of stroke and heart attack. Other medications can be prescribes such as “statin” drugs that will aid in the lowering of cholesterol level or anticoagulants which prevent blood clots. The hormonal medication can also help in increasing the weight and height of these inflicted children. This is necessary to help with the stiffness of the joint and hip problems and will help in blood circulation purposes. Also, it helps to make the child remain active. FTI or Farnesyltransferase inhibitor medications, which are known to treat cancer, have promising results in treating the Progeria disease. It corrects the cell defects that Progeria has. Yet this kind of medication is still being studied upon. Extracting the child’s tooth may help in the prevention of problems that are associated with delaying teeth loss. This is important to promote blood circulation. Smaller and frequent meals can help increase the caloric intake of a child with Progeria. Dehydration is a serious problem that is associated with this kind of disease condition. Hence, you need to let your child be well hydrated. As mentioned, the brain or the intellectual learning capabilities of a patient diagnosed with Progeria is not really affected. She or He can still go to school. 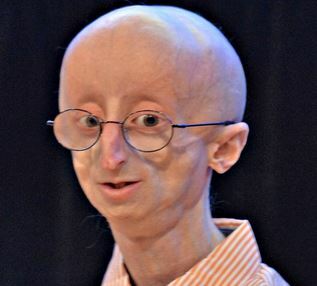 Immunizing a child with Progeria should also be done since studies show that all children are at risk when exposed to infectious disease condition. When a child is diagnosed with Progeria, studies showed that children with this condition have a shorter lifespan. They are often diagnosed at an early age of 7 years old and their maximum age of life expectancy will be fifteen to twenty years of age. However, some of the patients diagnosed with disease condition can live until age thirty. Most of the causes of death of these patients or children are usually related to heart disease, atherosclerosis disease or stroke.